Painter known for his iconic images of American Revolutionary War figures and battles. His famous painting, "Declaration of Independence" from 1817, appeared on the back side of the American two-dollar bill. He became a painter in spite of a childhood injury that left him virtually blind in one eye. He was General George Washington's second personal aide and also deputy adjutant-general to General Horatio Gates in June 1776. He was paid an annuity of $1,000 by Yale University in 1831 in exchange for 28 of his paintings and 60 of his miniature portraits. His father, Jonathan Trumbull, was Governor of Connecticut from 1769 until 1784. 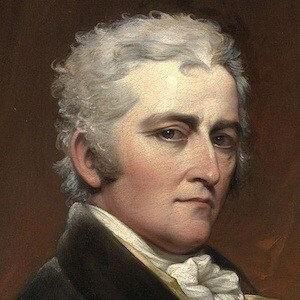 His first cousin, also named John Trumbull, was a well-known poet of his era. His famous 1792 oil painting, "George Washington Before the Battle of Trenton," was displayed at the Yale University Art Gallery.